Anyone else find it hard to believe we’re already a quarter of the way through 2019? January and February moved along at a slow but steady pace for me, while March flew by. I wish I could say the weather was spring-like in my little corner of Ontario, but considering we’ve had snow on and off the last few days, we’re not quite there yet. 2019 has been a great year for me so far. I’ve made some big changes in my life, especially pertaining to my physical and mental health. I’ve created a morning routine - 30+ minutes of exercise, followed by yoga and meditation - that I’m really proud of. I’ve been working away at my current work in progress (a contemporary romance), I’ve been reading as much as I can, and I’ve succeeded at my goal of having one new blog post each week. 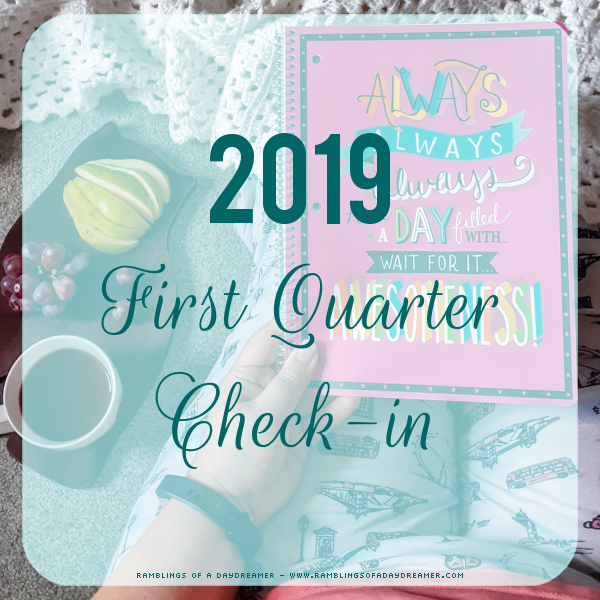 Here’s a closer look at what the first quarter of 2019 looked like for me: *I wrote 50,000 words on my current WIP. I’m so close to being finished the first draft! *It’s been a weird reading year for me. I’ve completed 11 books, but have had 10 DNFs. Ten! Of the books I’ve read, my favourites have been: -Happy New You by Brenda St John Brown, Cassie-Ann L Miller, Ceri Grenelle, Elizabeth Lynx, Jami Albright, Julia Wolf, Laura Lee, Marika Ray, Mya Martin, Nikky Kaye, and Sylvie Stewart -Hold Me Today by Maria Luis -The Upside of Falling Down by Rebekah Crane -At the Mountain’s Edge by Genevieve Graham You can see all my 2019 books (both read and DNFs) here. 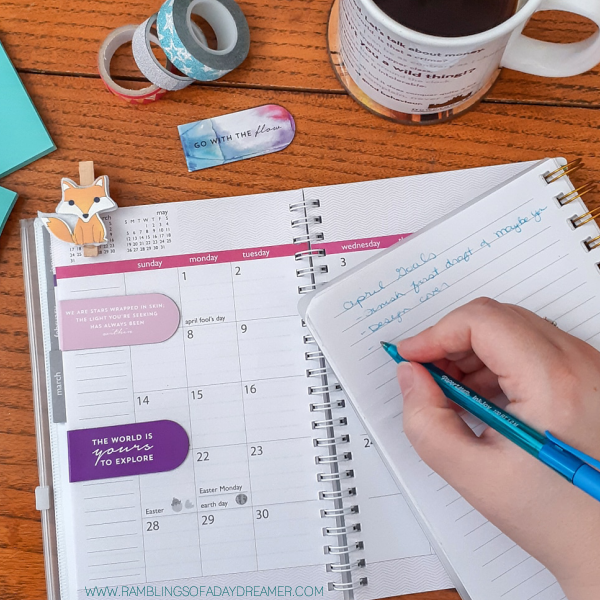 *On the blog: -Thoughts on How You Want to be Known in Life and How You Want to be Remembered -Spring Cleaning Isn’t Just For Your Home. Here’s How to Spring Clean Your Life Too -7 Books to Satisfy Your Ireland Wanderlust -2019: The Year of Big Life Changes -Experiencing Jealousy as an Author And How To Turn It Into Something Positive -One Day in December by Josie Silver: Did it Live Up to the Hype? -2018: A Year in Review *TV shows I’ve watched and loved: I haven’t been watching much TV this year, but I did watch Bodyguard and Medici: Masters of Florence in March (and I’ll admit both were 100% because Richard Madden was the star). I particularly loved Bodyguard and talked about some of the reasons why here. *I’ll be finishing and publishing my WIP. I have a title and a publication date in mind, but I’m keeping quiet about both for now. Stay tuned for more details! Once that’s finished, I have a *secret project* I’m excited to work on. I can give you a few hints: it's a series of three books, probably novellas, and they’re romantic comedies. *I’ll be doing some not-too-far travelling. Next month I’ll be spending a weekend with my bestie in my favourite Canadian city, Kingston, along with the Nation’s Capital, Ottawa. We’re planning to do a day at the Tulip Festival. I love Ottawa and I haven't been there in over a decade, plus I've always wanted to go to the Tulip Festival. In June, I’ll be spending a weekend in Toronto with another friend, attending a 90s Nostalgia Dance Party. If you know me at all, you'll know I live for 90s music. So much so, in fact, that in my last book, Only You, the main character Ivy was obsessed with 90s music too. I’m excited beyond words about both these things! *I’m going to continue focusing on my health and wellbeing. My body craves movement now, and I love the changes I’m seeing in my body, and how much better I feel. Meditation and journaling have also led to a vast improvement in my mental health. I’m much calmer, less anxious, less stressed, and I find it easier to just roll with things. How were the first three months of 2019 for you? Do you have anything big planned for the next quarter of the year? You're rocking the year, Marie. I'm happy to report that some changes I've made have been really good for me, too.